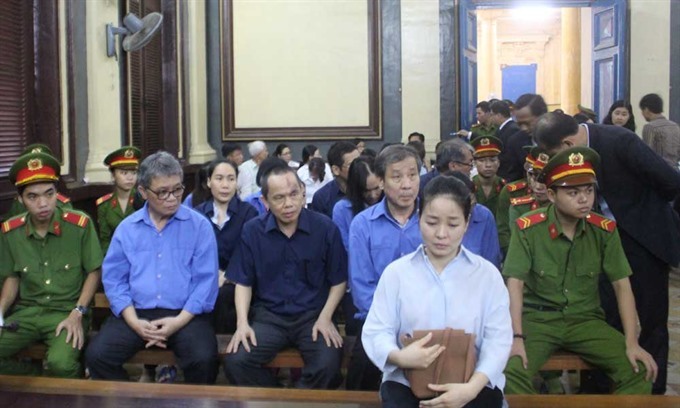 HCM CITY – The trial of 28 former officials of Đại Tín Bank (Trust Bank) (now Việt Nam Construction Bank) continued yesterday with a focus on how the former senior advisor of the management board of Trust Bank, Hứa Thị Phấn, was able to increase the value of her house at 5 Phạm Ngọc Thạch Street in District 3 in HCM City. The officials were charged with allegedly "abusing trust to appropriate property" and "intentionally violating state regulations on economic management and causing serious consequences". Phấn sold the house to Trust Bank, causing financial damages of over VNĐ1.1 trillion (US$48.5 million), according to the indictment. The Trust Bank’s Debt Management and Exploitation Company (Trust Asset) had been assigned by Trust Bank to verify the real price of Hứa Thị Phấn’s house in District 3. Trust Asset, which had registered capital of VNĐ100 billion ($4.4 million), was owned by Trust Bank. Hoàng Văn Toàn, chairman of Trust Bank, was chair of the Trust Asset’s board of managers. Trust Asset, however, did not have a price appraisal function, and was not included on a Ministry of Finance list of businesses permitted to verify prices when licences are granted. During the trial, defendant Toàn said that, besides not having the function of housing price verification, Trust Bank did not have the right to ask its company Trust Asset to verify the price for a property that Trust Bank would like to buy. Along with Toàn, other defendants on the management board also revealed that they all believed what Hứa Thị Phấn had said about the house, that it would be the headquarters for Trust Bank. After her request, all members of the management board signed a file agreeing to buy the house, which had been drawn up by Ngô Kim Huệ, Phấn’s niece and deputy general director of Trust Bank. Asked how they verified the price of the house as VNĐ1,268 billion ($56 million), nearly eight times higher than the market price, defendant Bùi Thế Nghiệp, housing appraisal staff of Trust Asset, said that he had done everything under the guidance of the former director Nguyễn Công Tụ. He said he received a real estate price verifying certificate after studying for only one and a half months. Meanwhile, the house was verified by different companies and the price ranged from VNĐ154 billion ($6.8 million) to VNĐ290 billion ($12.8 million), much lower than the selling price of VNĐ1,268 billion. On February 7, 2012, Phấn bought the house from Lam Giang Real Estate Joint-Stock Company at a price of VNĐ450 billion ($20 million). Six days later, she sold the house to Trust Bank for VNĐ1,268 billion. Phấn increased the value of her house, causing financial damages of over VNĐ1.1 trillion ($48.5 million). Phấn and her defendants have been charged with "abusing trust to appropriate property" and "intentionally violating state regulations on economic management and causing serious consequences". The investigation police concluded that violations committed by Phấn and others caused serious financial damage to Trust Bank, totaling VNĐ6.362 trillion ($280 million), excluding VNĐ5.64 trillion in damages from three other violations, which will be investigated in the second phase of the case.